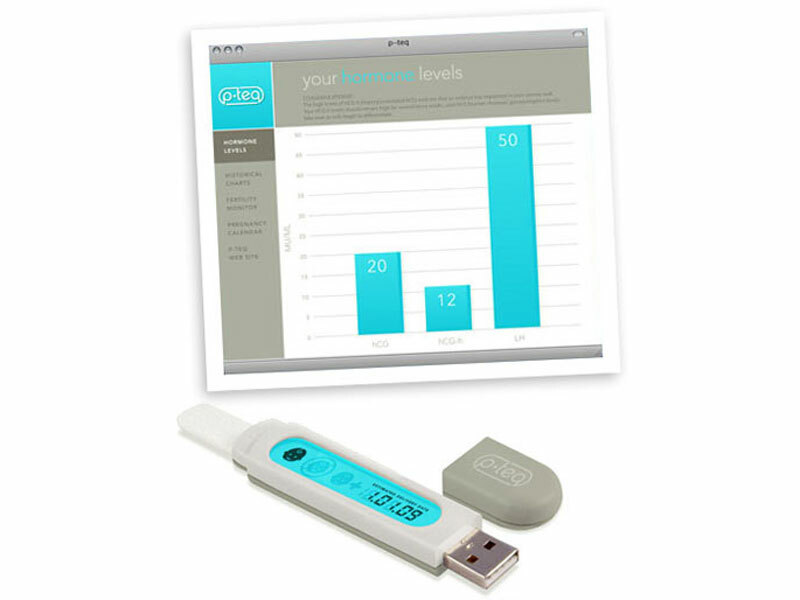 PTeq’s USB pregnancy test brings new meaning to peeing on a stick, and new geekery to waiting for one pink line or two. Instead of twiddling your thumbs in the bathroom, you pop the device into your computer to find out whether or not you’re pregnant. Simply do your business on the test strip end of the USB drive – obviously you want to make sure you’re using the right end – and then put the other end into your computer’s USB port. Sound crazy? Or like your bodily fluids will be a little too close for comfort to your electronics? Once inserted into your USB port, the Think Geek says the gadget completes an electrospray ionization process on the test strip. What comes next is a spectrograph of your urine analysis displaying a bar chart of your hCG (human Chorionic Gonadotropin), hCG-h (hyperglycosylated hCG), and LH (lutenizing hormone). If you love data, this pregnancy test would be perfect for you…if it wasn’t Think Geek’s latest April Fool’s spoof. If only someone would really come up with such a cool gadget! We love that this test promises to detect your most fertile days – perfect if you are trying to get pregnant – tell you if you’re having multiples, and even calculate your estimated due date. Plus, while most women trying to conceive hope they get it right the first time, with the first pregnancy test, chances are you’ll need to take a pregnancy test a few times before you see a plus sign, not to mention future testing for baby number two or three. So, we love that the P-Teq concept is reusable, meaning you won’t have to buy and toss plastic pee stick after pee stick! Oh please, we’d love someone to develop a reusable pregnancy test! PTeq's USB pregnancy test brings new meaning to peeing on a stick, and new geekery to waiting for one pink line or two. Instead of twiddling your thumbs in the bathroom, you pop the device into your computer to find out whether or not you're pregnant. Simply do your business on the test strip end of the USB drive - obviously you want to make sure you're using the right end - and then put the other end into your computer's USB port. Sound crazy? Or like your bodily fluids will be a little too close for comfort to your electronics?